In 2015, 94-year-old former German SS officer Oskar Gröning, nicknamed "The Accountant of Auschwitz", went on trial in his home country, charged with complicity in the murder of 300,000 Jews at Auschwitz in 1944. Gröning's trial made headlines around the world as a frail old man took the stand to face his former victims. Out of the 6,500 SS guards at Auschwitz, only 49 were prosecuted in West Germany. After the war, the country wanted to forget the past and move on. It was hard for the German public to accept that so many of its citizens were responsible for the horrific crimes committed under the Third Reich. Many of the lawyers and judges writing the new legal code were themselves former Nazis. Now, 70 years later, a new generation of lawyers armed with a change in legal thinking opened up a new wave of investigations against aging Nazi guards, now in their 90's. Most have perished, but for a man who at age 21, collected the stolen loot of prisoners as they were carted off trains at Auschwitz. 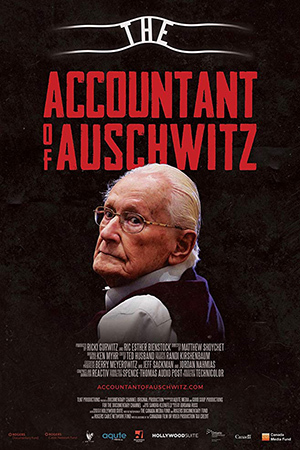 The Accountant of Auschwitz is a gripping look at the race against time to prosecute the last living Nazi war criminals before it's too late. Gröning's trial reflects not only one frail bookkeeper's penitence, but the world's responsibility to hold the worst of human horrors forever to public view. Bringing war criminals to justice, with no statute of limitations, asks fundamental moral questions with few simple answers. From Nuremberg to the new alt-right, The Accountant of Auschwitz constructs a stark reminder that those who forget history are doomed to repeat it.